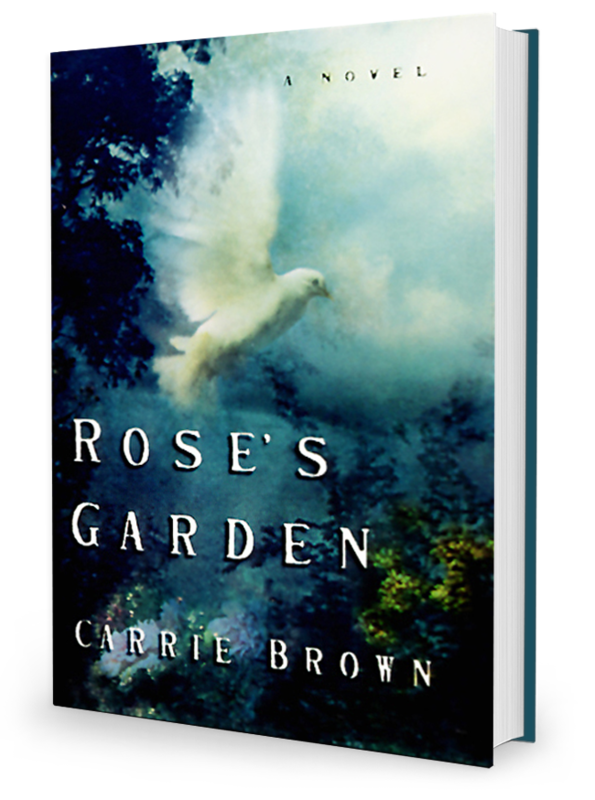 Rose’s Garden, Carrie Brown’s first novel, tells an unforgettable story of a woman whose garden extended far beyond the boundaries of property and time, and the man who came into full blossom in its bower. Conrad and Rose met as children, fell in love as teenagers, and married young. Conrad earned a living as a gilder, raised homing pigeons, and worshipped Rose. Rose gardened. They lived together for more than fifty years, and then Rose died. At seventy-five, Conrad found himself alone, staring at the walls of his house and neglecting Rose’s garden. Then an angel came to the garden, the last person he ever thought to see wearing wings. Startled, he felt compelled to spread the news throughout his town, and to his surprise, people he’d known all his life began to reveal their deepest selves to him. This quiet first novel, set in a tiny New Hampshire village in the White Mountains, concerns a small town’s varied reactions to the grief of a newly widowed man. Conrad Morrisey lives for his wife, Rose, and his homing pigeons. When Rose dies after a prolonged illness, Conrad retreats into a shell of memory and reflection. Through these myriad reflections, the reader comes to know and like Rose and to understand why her husband loved her so dearly. During one of the novel’s many significant thunderstorms, Conrad spies an angel in Rose’s vegetable garden and is immediately shaken loose from his emotional inertia. He feels compelled to share the experience with anyone who will listen, and this changes his relationship with the world forever in ways he never imagined. Firmly grounded by a strong sense of place, three-dimensional characters, and poetic writing, Rose’s Garden is a joy to visit. Beautiful, bittersweet, and always moving, it is highly recommended. A visit from an angel changes the life of a grieving widower in this moving first novel. Four months after the death of Rose, his wife of more than 50 years, Conrad Morrisey is drifting, neglecting himself and the garden his wife nurtured so lovingly–everything, in fact, except the homing pigeons he has raised since he was a boy. Yet somehow the garden flourishes, and baskets of delicious food–remarkably like what Rose used to cook for him–appear on his doorstep. Then an angel–his late father-in-law, Lemuel, who was his dear friend and mentor–appears in the garden, assuring Conrad of Rose’s love and leading him to open his life to the people of his small town, particularly a strangely reclusive young woman whom Rose had befriended. Once eager to accompany Lemuel to heaven, Conrad learns there is more for him to do on earth. This is a finely crafted, deeply touching love story, gentle as a soft breeze on one’s cheek and just as welcome. A wise, surprisingly deft, fablelike first novel celebrating the rejuvenating effects of love. Seventy-five-year-old Conrad, four months after the death of his beloved wife Rose, finds himself at loose ends, humbly going through life’s routines. Nothing stirs him, not his beloved flock of passenger pigeons, nor the odd, vivid life of the small New Hampshire town in which he and Rose lived for many decades — nothing, that is, until he rushes out one stormy night to tend to his flock, only to encounter an angel in the garden. Even more astonishing, the angel has the features of Conrad’s long-dead father-in-law, Lemuel. The message he carries is curiously simple: Rose loves him, and it is time for Conrad to “go home.” Not to heaven, but back to his home in this world, back to some sort of involvement with his neighbors. Conrad, dazzled, sets down the experience in a straightforward letter to the local newspaper. Its publication inspires a series of confessions by Conrad’s neighbors, a variety of stories about the irruption of mystery and the sacred into everyday life. Conrad begins to tend Rose’s vast, beloved garden again, finds himself building a tentative yet nourishing friendship with Hero, a deeply disturbed but profoundly gifted young woman who had been Rose’s gardening protege, and also finds, to his considerable surprise, that he now feels a clear appetite for life. Having worked as a gilder, covering everything from capitol domes to church spires to weather vanes in gold, “sealing the plain old world in shimmering layers,” he now discovers the extraordinary beauty already present in the world. And he’s given a chance to help save it when a ferocious storm causes a local dam to crumple, threatening his town and his friends. All of this would seem an unaffecting melodrama in less talented hands. But Brown nicely matches a shrewd eye for character with a fresh, unadorned, exact prose style. A warm, remarkably surefooted debut.